With the Superbowl coming up, I know what I'm making — my mom's Mexican dip! This recipe has been in our family for over 25 years and people request it at most family gatherings (even Thanksgiving!). It's cheesy, meaty and as Matt says "A meal on a chip!" I like to make it up the night before and leave it in the fridge so that all I have to do is pop it in the oven before the game starts. 1. Let cream cheese sit out on the counter to soften for 30 minutes. Once softened, use a spoon to spread across the bottom of a casserole dish that's at least 9x9. 2. After you've spread the cream cheese, add the can of green chiles. Spread evenly across. 3. Sprinkle about half of the bag of Mexican cheese blend for layer three. 4. For the next layer — spoon out the chili across the pan and spread with a spatula. 5. 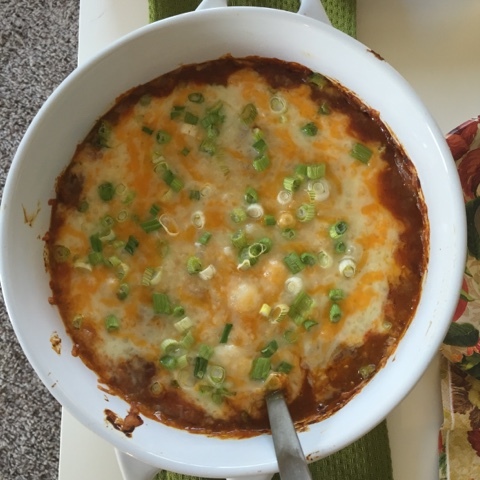 Top the chili with the remaining Mexican cheese blend and green onions. 6. Bake in a 350 degree oven for 30 minutes or until the edges start to bubble.